Vancouver, British Columbia--(Newsfile Corp. - January 15, 2019) - Precipitate Gold Corp. (TSXV: PRG) (the "Company" or "Precipitate") is pleased to announce it has closed the transaction previously announced with Everton Resources Inc. ("Everton"). The Company has now completed the transfer of title to fully acquire ownership of all of Everton's Dominican Republic exploration concessions, consisting of Pueblo Grande Project, adjoining Barrick's and Goldcorp's world-class Pueblo Viejo gold-silver mine, and the Ponton Project located approximately 30 kilometers ("km") east of Pueblo Grande (see news release dated October 24, 2018). Jeffrey Wilson, Precipitate President & CEO, stated: "We are pleased to have completed our due diligence, satisfied all requirements, and attained the necessary government and regulatory approvals to close this transaction and acquire a 100% interest in this exciting new landholding adjacent to one of the largest gold-silver mining operations in the world. During our due diligence period the Company's technical team has been actively plotting up proposed first phases of work within certain priority target areas and we expect work activities on the ground to commence soon. In preparation for the completion of this transaction, as reported in recent months, the Company has bolstered its Advisory team with the addition of former President and Executive Director of the Barrick-Pueblo Viejo mining operation, Mr. Mejico Angeles-Lithgow and increased its technical understanding of the projects through the engagement of consulting geologist, Dr. Stewart Redwood. With the acquisition now completed, Precipitate and its team are ready to begin a first phases of work." The Pueblo Grande's immediate exploration priority will be the area directly west of Barrick's mining pits, where a notable geophysical magnetic high coincides with an equally substantial area of advanced argillic lithocap alteration. This highly prospective lithocap target area measuring approximately 2.5 km by 3.0 km has seen little systematic exploration and will be the focus of initial phases of work. 40% (2,800,000 shares) with resale legend expiring 36 months from the date of issue. Additional stock payment conditions and details of pre-existing advanced-stage or mining-related commitments, including an underlying NSR to a third party can be found in the Company's news release dated October 24, 2018. Two concessions, comprising a portion of the Pueblo Grande Property, are contiguous to the neighbouring Pueblo Viejo mine. The third concession (the "Ponton Project") acquired in this transaction is located approximately 30 km east of Pueblo Grande in a similarly favourable and prospective geological environment. The Company has also submitted exploration concession applications for an additional strategic land position connecting the two main Everton concessions along the eastern boundary of the Pueblo Viejo mine to form the newly consolidated Pueblo Grande Property. 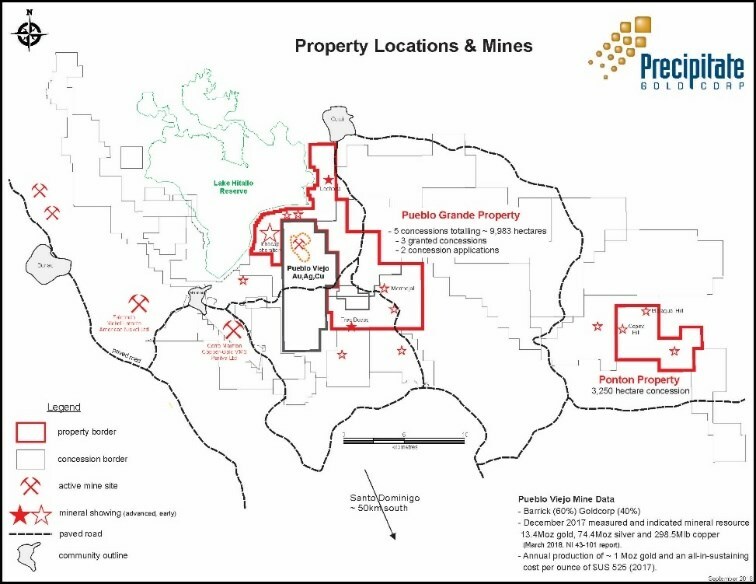 As a result, Precipitate's new land position adjoins Barrick's Pueblo Viejo mine site on the west, north and east sides, covering about 9,963 contiguous hectares. See the Company's news release dated October 24, 2018 for more project information and the accompanying maps or the Company's website at www.precipitategold.com for the property location illustration maps. The area to the west of the Pueblo Viejo mine is interpreted to be a high-level advanced argillic lithocap alteration type environment which lacks significant known surface gold-silver mineralization but has anomalous trace element suite that typifies the adjacent Pueblo Viejo mineralization style. The lithocap alteration is dominated by pervasive quartz-pyrophyllite-pyrite with numerous and widespread irregular pods, veins, and veinlets of massive hematitized magnetite. Magnetite/hematite, silicification and various pathfinder elements associated with Pueblo Viejo style high sulphidation epithermal gold-silver-copper mineralization offer key exploration vectors into and through the extensive altered lithocap zone. Precipitate Gold Corp. is a mineral exploration company focused on exploring and advancing its mineral property interests in the Pueblo Viejo Camp and Tireo Gold Trend of the Dominican Republic. The Company also maintains the Reef property located immediately adjacent to Golden Predator's 3 Aces Project in the Upper Hyland River area, Yukon Territory. The Company has entered into an Option to Purchase Agreement with Golden Predator whereby Golden Predator can earn a 100% interest in the Reef claims by making certain staged payments in cash and shares and warrants. Precipitate is also actively evaluating additional high-impact property acquisitions with the potential to expand the Company's portfolio and increase shareholder value.